Want to do something fun on World Down Syndrome Day? 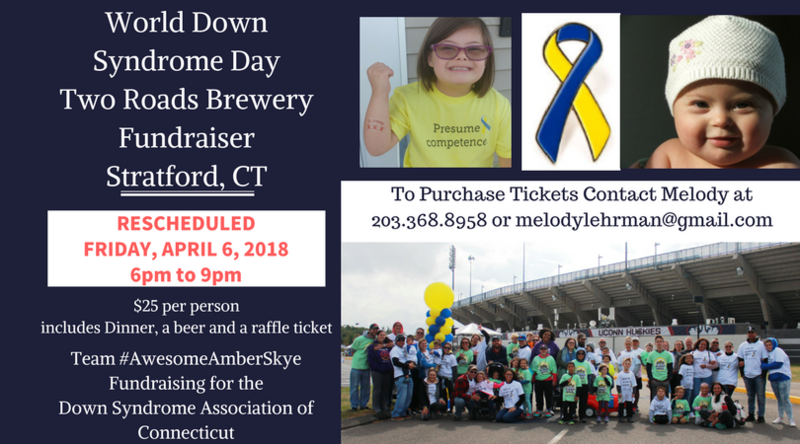 Team #AwesomeAmberSkye is having a fundraiser for the Down Syndrome Association of CT (formerly known as CDSC) at TWO ROADS BREWERY in Stratford, CT on Friday 4/6/18 from 6pm to 9pm. $25 per person includes dinner (donated by Vazzy's of Stratford, Riverview Bistro, Cibus Latin Fusion and Puerto Vallerta of Orange), dessert, a Two Roads beer and a raffle ticket! This will be a great time in the vault room with friends, music, corn hole, and a raffle! We are looking for Volunteers and Donations to make raffle baskets. Let Melody know if you have any leads.